Downtown Houston is Houston's central business district, containing the headquarters of many prominent companies. There is an extensive network of pedestrian tunnels and skywalks connecting the buildings of the district. The tunnel system is home to many restaurants, shops and services. 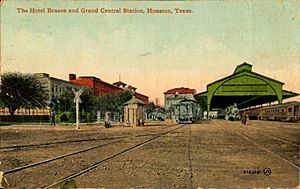 What is now Downtown made up almost all of the City of Houston until expansions of the city limits in the early 20th century. Downtown Houston was the original founding point of the city. After the Texas Revolution, two New York real estate promoters, John Kirby Allen and Augustus Chapman Allen, purchased 6,642 acres (2,688 ha) of land from Thomas F.L. Parrot and his wife, Elizabeth (John Austin's widow), for $9,428. The Allen brothers first landed in the area where the White Oak Bayou and Buffalo Bayou meet, a spot now known as Allen's Landing. Gail Borden, Jr., a city planner, laid out wide streets for the town. The city was granted incorporation by the Texas legislature on June 5, 1837. Houston was the temporary capital of Texas. In 1840, the town was divided into four wards, each with different functions in the community. By 1906 what is now Downtown was divided among six wards. The wards are no longer political divisions, but their names are still used to refer to certain areas. 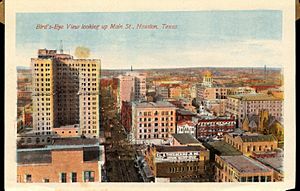 Downtown's growth can be attributed to two major factors: The first arose after the Galveston Hurricane of 1900, when investors began seeking a location close to the ports of Southwest Texas, but apparently free of the dangerous hurricanes that frequently struck Galveston and other port cities. Houston became a wise choice, as only the most powerful storms were able to reach the city. The second came a year later with the 1901 discovery of oil at spindletop, just south of Beaumont. Shipping and oil industries began flocking to east Texas, many settling in Houston. From that point forward the area grew substantially, as many skyscrapers were constructed, including the city's tallest buildings. In the 1980s, however, economic recession canceled some projects and caused others to be scaled back, such as the Bank of the Southwest Tower. 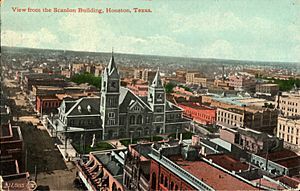 In the 19th century much of what was the Third Ward, the present day east side of Downtown Houston, was what Stephen Fox, an architectural historian who lectured at Rice University, referred to as "the elite neighborhood of late 19th-century Houston." Ralph Bivins of the Houston Chronicle wrote that Fox said that area was "a silk-stocking neighborhood of Victorian-era homes." Bivins said that the construction of Union Station, which occurred around 1910, caused the "residential character" of the area to "deteriorate." Hotels opened in the area to service travelers. Afterwards, according to Bivins, the area "began a long downward slide toward the skid row of the 1990s" and the hotels devolved into flophouses. Passenger trains stopped going to Union Station in 1974. The construction of Interstate 45 in the 1950s separated portions of the historic Third Ward from the rest of the Third Ward and brought those portions into Downtown. Beginning in the 1960s the development of the 610 Loop caused the focus of the Houston area to move away from Downtown Houston. Joel Barna of Cite 42 said that this caused Greater Houston to shift from "a fragmenting but still centrally focused spatial entity into something more like a doughnut," and that Downtown Houston began to become a "hole" in the "doughnut." As interchange connections with the 610 Loop opened, according to Barna Downtown "became just another node in a multi-node grid" and, as of 1998, "has been that, with already established high densities and land prices." In the mid-1980s, the bank savings and loan crisis forced many tenants in Downtown Houston buildings to retrench, and some tenants went out of business. Barna said that this development further caused Downtown Houston to decline. The Gulf Hotel fire occurred in 1943. On April 5, 1986, the entire Downtown area was transformed as part of a concert by French musician Jean Michel Jarre. 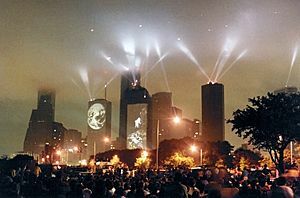 Called Rendez-Vous Houston, the open-air show used the skyscrapers as giant projection screens, and as launchpads for fireworks. The show celebrated 25 years of NASA, 150 years of Texas, and was a tribute to the astronauts killed in the recent Challenger Disaster. The show attracted a then-record live audience of 1.3 million people. 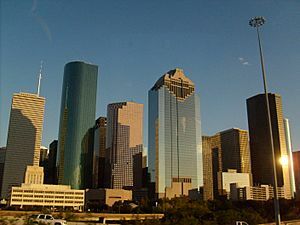 Areas which are, as of 2009, considered to be a part of Downtown Houston were once considered to be within the Third Ward and the Fourth Ward communities; the construction of Interstate 45 in the 1950s separated the areas from their former communities and placed them in Downtown. Additional freeway construction in the 1960s and 1970s formed the current boundaries of Downtown. Originally, Downtown was the most important retail area of Houston. Suburban retail construction in the 1970s and 1980s reduced Downtown's importance in terms of retail activity. By 1987 many of the office buildings in Downtown Houston were owned by non-U.S. real estate figures. The Texas Legislature established the Downtown Houston Management District in 1995. The arrival of major industry also saw the advent of skyscrapers in Houston. The building boom of the 1970s and 1980s saw the erection of major buildings, many of them ranking as the tallest in the state and the nation. More recently, the Downtown Living Initiative provided economic and other development incentives for developers to build new multifamily residential mixed-use developments in Downtown in an attempt to attract more. Warehouse – Home to Houston’s alternative art scene, unique dining options, live music, artists’ studios and downtown’s first lofts. 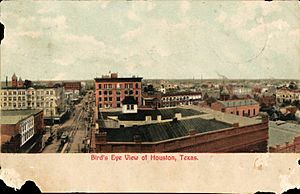 Historic – This was the original town center of Houston and dates from the 19th century. The center of the historic district is the Market Square, where the original city hall building stood. Harris County – The district includes the Harris County courts complex, and the University of Houston–Downtown is on the edge of the district. Ballpark – Includes Minute Maid Park and surrounding restaurants, lofts, and office space. Convention – Includes the George R. Brown Convention Center, Discovery Green, the Toyota Center, and some of the largest hotels in the city. Skyline – Includes many skyscrapers and forms the base of Downtown's employment. The buildings are connected by the extensive underground tunnel network. Shopping – Main Street Square has a pavilion and fountains built around the Main Street Square Station – GreenStreet and the Shops at Houston Center are in the area. Medical – Includes St. Joseph Medical Center, residential properties and the Sacred Heart Co-Cathedral campus. By the late 1980s, 35% of Downtown Houston's land area consisted of surface parking. n Houston. By the end of 1999, the number was expected to increase to almost 2,000 units. Most of the residential units in downtown are conversions of older buildings into modern loft spaces. The lofts are located around the performance halls of the Houston Theater District and near Main Street in the Historic District. In spring 2009, luxury high-rise One Park Place opened-up with 346 units. Developers have invested more than 4 billion US$ in the first decade of the 21st century to transform downtown into an active city center with residential housing, a nightlife scene and new transportation. January 1, 2004 marked the opening of the "new" Main Street, a plaza with many eateries, bars and nightclubs, which brings many visitors to a newly renovated locale. Phoenicia Specialty Foods opened a downtown grocery store in 2011. As of 2009, 15,745 resided in Downtown. 6,061 (38.5%) were Black, 5,693 (36.2%) were Hispanic, 3,675 (23.3%) were White, 215 (1.4%) were Asian, 15 (.4%) were Native American, 2 were Pacific Islanders, and 4 were of other races. As of 2000, of the 12,407 Downtown residents, 10,437 were in group quarters. Of those, 9,653 were institutionalized, with 9,394 being institutionalized in correctional institutions. In the 1960s, downtown comprised a modest collection of mid-rise office structures, but has since grown into one of the largest skylines in the United States. In 1960, the central business district had 10 million square feet (930,000 m²) of office space, increasing to about 16 million square feet (1,500,000 m²) in 1970. 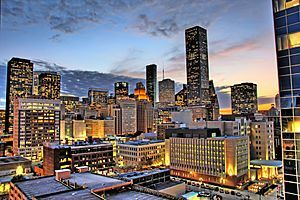 Downtown Houston was on the threshold of a boom in 1970 with 8.7 million square feet (800,000 m²) of office space planned or under construction and huge projects being launched by real estate developers. The largest proposed development was the 32-block Houston Center. Only a small part of the original proposal was ultimately constructed, however. Other large projects included the Cullen Center, Allen Center, and towers for Shell Oil Company. The surge of skyscrapers mirrored the skyscraper booms in other cities, such as Los Angeles and Dallas. Houston experienced another downtown construction spurt in the 1970s with the energy industry boom. 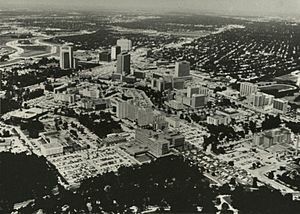 The first major skyscraper to be constructed in Houston was the 50-floor, 218 m (714 ft) One Shell Plaza in 1971. A succession of skyscrapers were built throughout the 1970s, culminating with Houston's tallest skyscraper, the 75-floor, 305 m (1,002 ft) JPMorgan Chase Tower (formerly the Texas Commerce Tower), which was completed in 1982. In 2002, it was the tallest structure in Texas, ninth-tallest building in the United States, and the 23rd tallest skyscraper in the world. 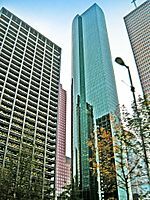 In 1983, the 71-floor, 296 m (970 ft) Wells Fargo Plaza was completed, which became the second-tallest building in Houston and Texas, and 11th-tallest in the country. Skyscraper construction in downtown Houston came to an end in the mid-1980s with the collapse of Houston's energy industry and the resulting economic recession. 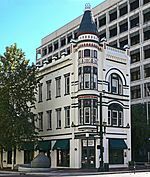 The Sweeney, Coombs, and Fredericks Building is a late Victorian commercial building with a 3-story corner turret and Eastlake decorative elements that was designed by George E. Dickey in 1889. Evidence indicates that the 1889 construction may have been a renovation of an 1861 structure built by William A. Van Alstyne and purchased in 1882 by John Jasper Sweeney and Edward L. Coombs. Gus Fredericks joined the Sweeney and Coombs Jewelry firm before 1889. The building is on the corner of Main Street and Congress Street at 301 Main Street. The jewelry firm is still in business. It is one of the very few Victorian structures in the Bayou City. The Gulf Building, now called the JPMorgan Chase building, is one of the preeminent Art Deco skyscrapers in the southern United States. Completed in 1929, it remained the tallest building in Houston until 1963, when the Exxon Building surpassed it in height. The Esperson Buildings, 'Neils' built in 1927 and 'Mellie' in 1942, were modeled with Italian architecture. The Houston City Hall was started in 1938 and completed in 1939. The original building is an excellent example of the Art Deco Era. In front of City Hall is the George Hermann Square. 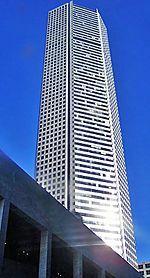 One Shell Plaza was, at its completion in 1971, the tallest building in Houston. It stands 715 feet (218 m) tall, and when the antenna tower on its top is included, the height of One Shell Plaza is 1,000 feet (300 m). 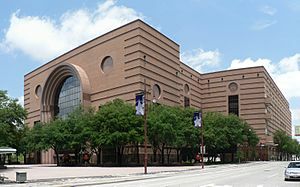 Houston Public Library's Central Library, consists of two separate buildings: the Julia Ideson Building (1926) and the Jesse H. Jones Building (1976). The Houston Industries Building, formerly known as the 1100 Milam Building, was built in 1973. It went through major renovations in 1996. Pennzoil Place, designed by Philip Johnson, built in 1976, is Houston's most award winning skyscraper, known for its innovative design. Johnson's forward thinking brought about a new era in skyscraper design. The First City Tower was built in 1981. The JPMorgan Chase Tower, designed by I.M. Pei, was built in 1981. Formerly the Texas Commerce Tower, it is the tallest in Houston and the second tallest in the United States west of the Mississippi River. The Chevron Tower, formerly the Gulf Tower, was built in 1982. The Bank of America Center, formerly the RepublicBank Center and the NationsBank center, designed by Philip Johnson, was built in 1983. The Wells Fargo Bank Plaza, formerly the Allied Bank Plaza and First Interstate Center, also built in 1983, is the second tallest building in the Houston Area. The Heritage Plaza was completed in 1987. The Enron Center North, also known as the Four Allen Center, was also built in 1983. The Enron Center South, also the Enron II, designed by Cesar Pelli was completed in 2002. (Note: Enron went bankrupt before the building's completion and was sold soon after it was completed for about half of its $200 million construction cost). 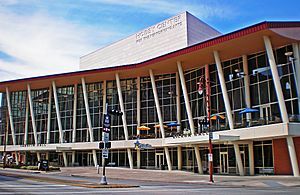 The Hobby Center for the Performing Arts was started in 2000 and completed in 2002. The Lyric Centre is filled with lawyers, but is named for its adjacency to the many performing arts venues in Houston's Theater District. The Carter Building, once the tallest building in Texas, more recently re-purposed as a hotel. The Scanlan Building, 405 Main Street (at Main and Preston), is a 76,403sq.ft building located just one block from the Harris County Courthouse. The Scanlan building was built on the site of the first official "White House" of the Republic of Texas. What is now a Houston high-rise office building was built in 1909 by the daughters of Thomas Howe Scanlan, to honor their father, former mayor of Houston (1870-1873). It is a Houston Landmark and is listed in the U.S. National Register of Historic Places. 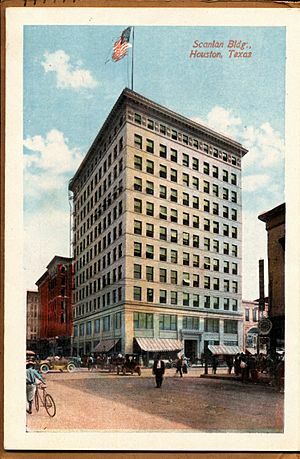 In 1909, the Scanlan Building was billed as “The largest building in the largest city in the largest state." The Consulate-General of the United Kingdom is located in Wells Fargo Plaza, while the Consulate-General of Japan is located in Two Houston Center. The Consulate-General of Switzerland, which resided in Downtown Houston, closed in 2006. 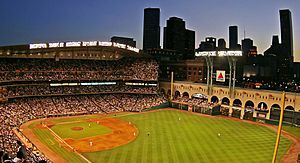 Downtown Houston has three major league sports venues. Minute Maid Park (formerly Enron Field), which opened in 2000, is home to the MLB Astros and the Toyota Center home to the NBA Rockets opened in 2003. 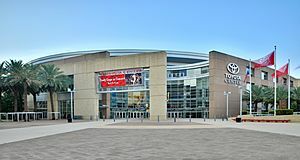 Toyota Center was home to the now defunct WNBA Comets from 2004-2007. BBVA Compass Stadium which seats 22,039 opened in 2012 and is home to the MLS Dynamo and to the collegiate football team Texas Southern Tigers. The Downtown Houston Theater District is one of the largest in the country as measured by the number of theater seats. 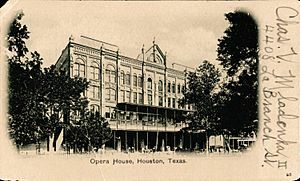 Houston is one of only five cities in the United States with permanent professional resident companies in all of the major performing art disciplines of opera, ballet, music, and theater. 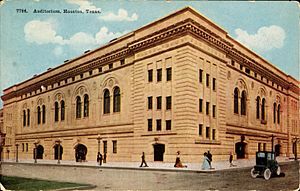 Venues in the theater district include the Wortham Center (opera and ballet), the Alley Theatre (theater), the Hobby Center (resident and traveling musical theater, concerts, events), the Bayou Music Center (concerts and events) and Jones Hall (symphony). The George R. Brown Convention Center, with its 1,800,000 square feet (170,000 m2) of flexible exhibit, meeting, and registration space and adjacent hotels, is frequently used for conventions, trade shows, and community meetings. A number of restaurants and retail spaces were recently added to the first floor. JW Marriott Downtown Houston and its 234,398sq.ft of building floor area. Hyatt Regency Houston, which features a revolving restaurant, the Spindletop, located on the hotel's 30th floor. The Shops in Houston Center, located within the Houston Center complex, is an enclosed shopping mall. A few blocks away, GreenStreet is an open-air shopping center. The Houston Downtown Tunnel System is also home to many shops and restaurants. Several restaurants in Downtown Houston are in the Tunnel system, only open during working hours. Metropolitan Transit Authority of Harris County, Texas (METRO) operates Houston's public transportation. 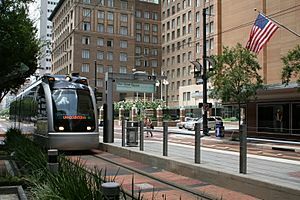 Downtown Houston is served by five light rail stations on METRORail's Red Line: Downtown Transit Center, Bell, Main Street Square, Preston, and UH–Downtown. It is also on METRORail's Southeast/Purple Line and East End/Green Line: Central, Convention District, and Theater District stations are along the Green and Purple lines. METRO operates many bus lines through Downtown. Downtown Houston has a free bus route called Greenlink. The route travels along a 1.5 miles (2.4 km) circular route in Downtown Houston. Seven buses are funded with two Federal Transit Administration grants that total $2.25 million. It operates from 6:30 AM to 6:30 PM, Monday through Friday. During periods with less ridership, the buses arrive every twenty minutes. For periods with peak ridership, including lunchtime, buses arrive every seven minutes. The buses run on Dallas Street, Louisiana Street, Smith Street and Walker Street. The buses are used to connect retailers and restaurants in Houston Center and GreenStreet, to office workers and convention clients in southwestern Downtown. The Downtown Houston Management District, BG Group and Houston First Corporation, a local government corporation that owns the Hilton Americas-Houston and manages the George R. Brown Convention Center and other city-owned buildings, pays for the operating expenses of the route. METRO formerly operated a free intra-Downtown bus service. When the service operated at its peak, METRO had a fleet of 28 trolley-style buses. At its peak the service carried over 10,000 riders each day on five different routes. When METRO introduced a 50 cent rider fee in 2004, the ridership decreased dramatically, and in 2005 METRO ended the service. There are a number of taxi cabs that can be hailed from the street, twenty-one taxi stands, or at the various hotels. Trips within downtown have a flat rate of $6 United States dollars by cab. After the METRO trolley service ended, the City of Houston enacted the required flat $6 fee for all travel within Downtown. To make up for the loss of the METRO trolley, jitney and pedicab services appeared. Since the implementation of transportation network company ordinance in 2014, Uber continues to operate within the city and surrounding areas. George H.W. 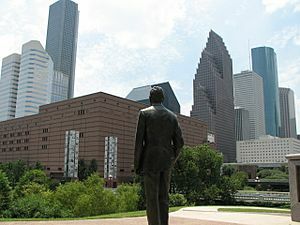 Bush statue in Sesquicentennial Park looking towards Downtown Houston. Sam Houston Park, on the western edge of downtown between McKinney and Dallas/Allen Parkway, is home to the Houston Heritage Society and a collection of historic buildings and homes from around Houston. Tranquility Park, bound by Rusk, Smith, Walker, and Bagby, uses open green spaces and a series of interconnected fountains to commemorate NASA's landing on the moon's Sea of Tranquility. 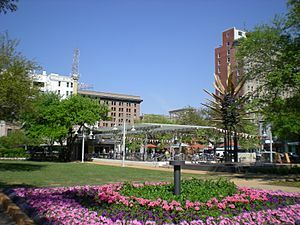 Market Square Park, between Travis, Milam, Preston, and Congress, preserves the block formerly covered by Houston's open air market which fronted the old City Hall. In August 2010, Market Square Park unveiled renovations complete with two dog runs, Niko Niko's at Market Square, and Houston's only 9/11 memorial. Hermann Park, located between Fannin, Cambridge, and Main Street, is home to numerous cultural institutions including the Houston Zoo, Houston Garden Center, Miller Outdoor Theatre, Houston Museum of Natural Science, the Japanese Garden, and the Hermann Park Golf Course. It is within walking distance of the Texas Medical Center, the Museum District, and Rice University. The land which it occupies was presented to the City of Houston by George H. Hermann in 1914. Allen's Landing, on Buffalo Bayou at Smith and Preston, commemorates the landing site of the Allen Brothers, founders of the City of Houston. Sesquicentennial Park, across Buffalo Bayou from Allen's Landing, contains a statue of George H.W. Bush, Houstonian and 41st President of United States. Main Street Square, a pedestrian mall with a reflection pool and fountains on the MetroRail line between Lamar and Dallas. Root Memorial Square, a one-block park across La Branch St from the Toyota Center. Sisters of Charity Park, a quiet area in St. Joseph's Medical Center in the southeast corner of downtown. Discovery Green, west of the George R. Brown Convention Center, officially opened on April 13, 2008 with a Family Day event. The park has underground parking, an amphitheater, two restaurants, a dog run, a jogging trail around the park, a great Lawn, an interactive fountain and more. Harris County Precinct One operates the 2-acre (8,100 m2) Quebedeaux Park at 1115 Congress Street. The park includes a stage area, picnic tables, and benches. The park surrounds the Harris County Family Law Center. The Downtown YMCA is located at 1600 Louisiana Street. The Tellepsen facility includes a center for teenagers, a wellness center for females, a child watch area, a community meeting space, a chapel, group exercise rooms, and a racquetball court. The groundbreaking ceremony occurred on January 7, 2009. The new facility will not have dormitories for homeless that exist in the current YMCA facility. The Downtown YMCA had provided dormitory space for around 100 years. Katharine Shilcutt of the Houston Press said in 2012 that because of the Houston tunnel system taking traffic during the daytime and many office workers leaving for suburbs at night, many street level restaurants in Downtown Houston have difficulty operating. She added that the popularity of business-related lunches and dinners resulted in steakhouses in Downtown becoming successful. All are located around a central Plaza, nicknamed "Justice Square", located above the new underground Harris County Jury Plaza. Along with Harris County's facilities, there are several Constable courts and support facilities nearby. Downtown Houston Facts for Kids. Kiddle Encyclopedia.